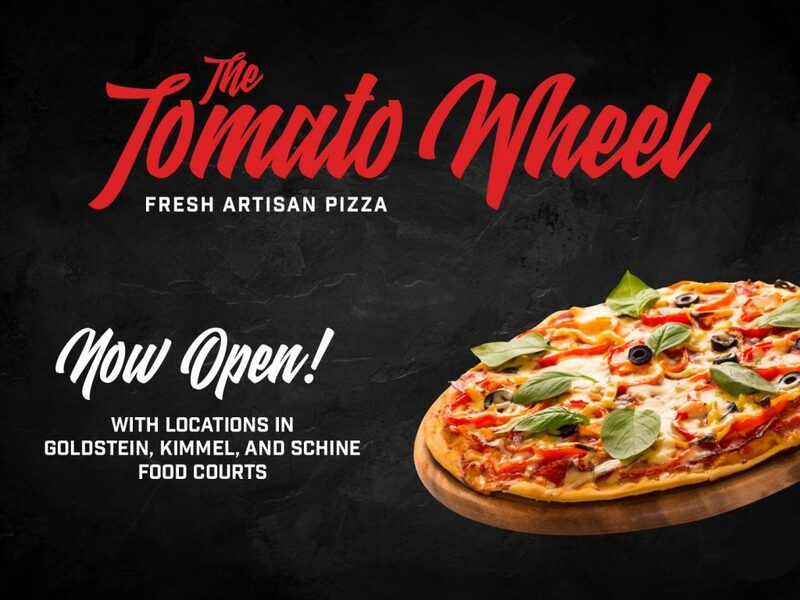 The new pizza concept in the student centers, The Tomato Wheel, announces a grand opening celebration this Thursday and Friday, Sept. 13 and 14. Diners at its locations in Schine, Goldstein and Kimmel Food Court can expect to win prizes ranging from a free slice to a whole pizza, along with coupons, giveaways, and even a visit from Otto! For your chance to grab a slice with Otto, visit Schine Dining this Thursday between 11:30 a.m. to noon or Goldstein Dining from 6:30 to 7 p.m.
Schine Dining: 11 a.m. to 7 p.m.
Goldstein Dining: 11 a.m. to 1 a.m.
An artisan pizza shop operated by SU Food Services, The Tomato Wheel serves handmade pizza wheels, twists, garlic knots and pizza by the slice, including vegan and gluten free options. Replacing the Sbarro pizza chain, The Tomato Wheel provides SU Food Services with flexibility, allowing them to implement changes, try new menu items and respond instantly to feedback. Diners are encouraged to make suggestions to a manager or email mealtalk@syr.edu with recipe ideas or comments. The Tomato Wheel opened in June of this year.